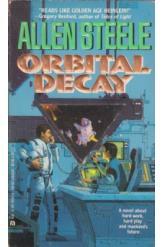 Orbital Decay by Allen Steele, Sci Fi. Book is in good condition, all pages intact. A story of the "beamjacks," the subculture of space construction workers who spend years at a time in orbit working on massive satellites.